Shocking news coming from the state capitol this morning where Senator Leland Yee has been indicted on bribery and public corruption charges. At the same time of his indictment, Scott Lay of Around the Capitol reports a series of arrest warrants were executed in San Francisco and across the Bay Area on known and suspected gang members. At the same time, searches of the Chinatown office of the Gee King Tong Free Masons are being conducted. This is, reportedly, in conjunction with the arrest of known gang member, Raymond “Shrimp Boy” Chow. Chow has previously renounced his gang affiliations after being honored by Senator Diane Feinstein and others for civic achievements. Yee apparently turned himself in at the Federal Building this morning after being informed of the charges. Yee is running for State Controller agains fellow Democrat, Alex Padilla. The Sacramento Bee states that Yee, a child psychologist, is best known for legislation regarding video game violence and open records laws. 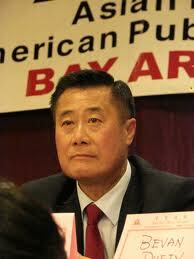 Yee has recently been criticized for his legislation regarding solitary confinement of juvenile offenders. Author of a bill that would have required the intervention of a psychiatrist in order to place a ward in their cell for more than an hour at a time, Yee’s bill was subsequently amended to allow for wider latitude of the use of “room time” as a consequence for uncontrollable behavior. The arrest of Yee follows on the recent departures of Senators Rod Wright and Ron Calderon. Calderon is under investigation for bribery and corruption charges while Wright has recently been convicted of perjury and voter fraud. This leave the Democractic Senate in a lurch as their supermajority goes down the drain. Apparently the ramifications haven’t sunk in yet, because Democrats are still acting as if they can run roughshod over Republicans. They can’t. Without their supermajority, Democrats lost an opportunity to pass SB 27, the dark-money bill. The legislation was proposed after two groups linked to conservative bankrollers Charles and David Koch funneled $15 million to California campaigns in 2012. The bill would have closed loopholes in current law by requiring that nonprofits that make at least $50,000 in political expenditures in a year must reveal their donors, and independent campaign committees that raise $1 million must publish a list of their top 10 contributors. Yee’s status is unclear and we will have to wait to see how sure the Feds are of themselves. This definitely puts a hammer on Yee’s aspirations and it appears another career politician will bite the dust, regardless of the eventual outcome. Yee for his part has yet to say anything about the charges. It should be interesting if he come out fighting or just slinks away to hide in Chinatown. Posted on March 26, 2014, in elections, In the News, politics and tagged capitol, criminal, Diane Feinstein, legislature, leland yee, public corruption charges, sacramento, Scott Lay. Bookmark the permalink. 2 Comments. In “calling for their heads” in this situation, the Republicans are advocating against their own interests. In California’s legislature, the number of “NO” votes does not matter – it takes a fixed number of “YES” votes to pass legislation – either a majority or two-thirds. Thus, a Senator who cannot vote is essentially voting like a Republican – voting “NO” on everything for all intents and purposes as they are not there to help pass the majority’s legislation. As these all come from clearly Democratic districts, the sooner they are replaced and their Democratic replacements are voting, the more legislative power the Democratic majority will have. The longer they are given to “see how things work out” or whatever the rationale may be, the longer those seats are voting de facto with the Republicans. That’s an interesting perspective. But, in the short run, the Reps have an advantage. Can they keep it?